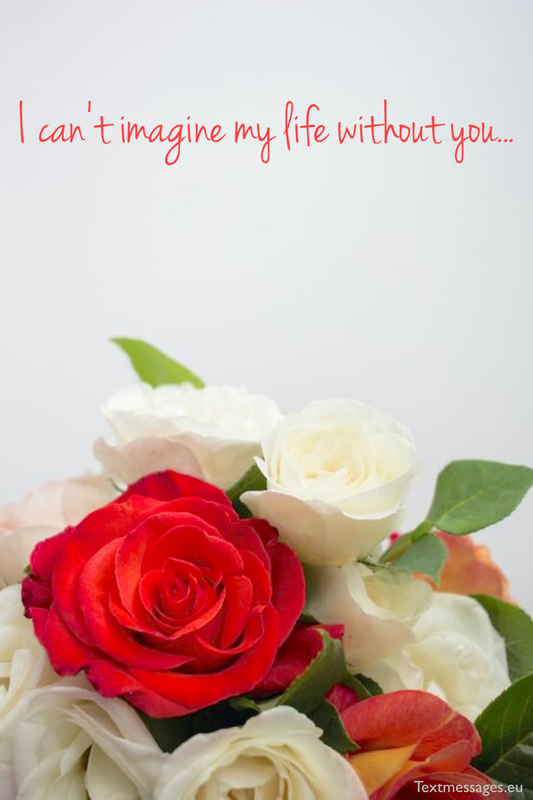 Many women dream to meet a romantic man – the one who would bring them flowers and send love messages. 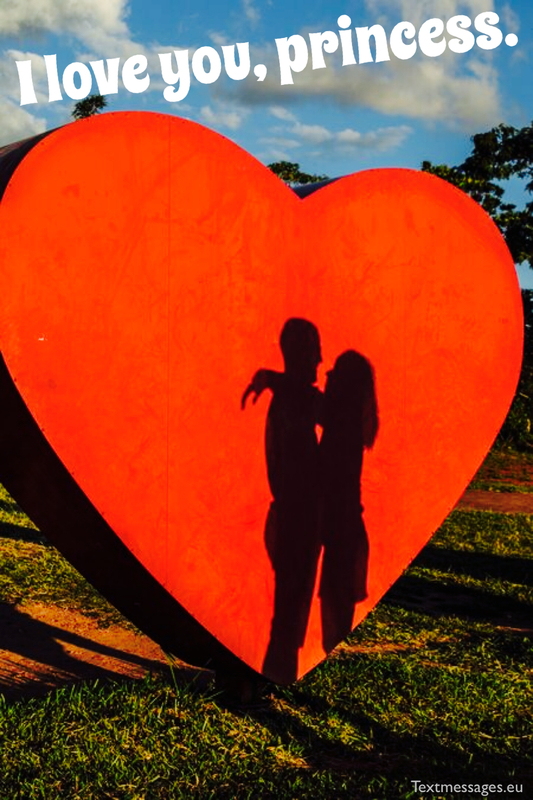 On this page we present you a wide range of love messages for her that will help you to express your deep devotion to your sweetheart and become the man of her dreams. One lifetime will never be enough to enjoy sharing nights and days with you, to tell you how much I love and need you. Life is really too short for such big and everlasting love. I wish I could live forever just to see you every single day and give you all my love and care for the whole eternity. I’m tired of hiding things inside. I’m tired of being overwhelmed with emotions. I’m tired of lying to myself, and now it’s time to reveal the truth. I love you. I know that you don’t feel the same right now, but I still hope that someday you’ll see me as something more than just a friend. Sometimes it seems to me that I had fallen in love with you long before I was born. You are my first and only love, and I believe that I will continue loving you after my death and I will love in the next lives. Forever and always. When I’m with you I feel like I am the strongest man on Earth. I’m undefeatable and tireless. Oh, darling, I’m full of love and inspiration. You are the only one who makes me feel this way, and I wish it would never stop. Love you. Our relationship is like a roller-coaster. It’s extreme, unexpected, unpredictable, exciting and dizzying in a good way. It gives me the chills, it makes me go crazy, but I feel like I’m the happiest man in the world, because there’s nothing worse than a boring and dull relationship. They say that the best way to define the importance of a person is to imagine your life without this person. Well, it seems to me that you’re of really great importance to me, because I can’t imagine my life without you at all. Sometimes I wish I had a cure from love, because it’s unbearable to see your perfect face every day and not to be able to touch it. It’s so hard to love every inch of your body and your soul and not to be able to tell you that, because you belong to somebody else… It hurts to love you, but I won’t ever stop. Please, tell me it is not going to end. You make me the happiest man on Earth, and I do my best to make you the happiest woman. We’re a perfect couple, because we have so much love inside of us and we’re always eager to share it with each other. Sometimes I wish I had more courage in me and I weren’t afraid to talk about my feelings. But I’ve been keeping it inside for too long, and now I’m ready to explode, to tell the whole world about what I feel. And do you know what I feel? I feel deep and burning love for you. It’s time for you to know that. There are so many different words to express our affections. I can say either I like you, or adore you, or love you, or I’m obsessed with you, but none of these words will describe what I exactly feel. What I really feel can’t be put into any word. I’m not afraid neither of spiders, nor of darkness, nor of death. The only thing I truly fear is losing you. Because you give me strength and inspiration to go through life and notice wonderful things around me. You give me the power to love and to be loved. 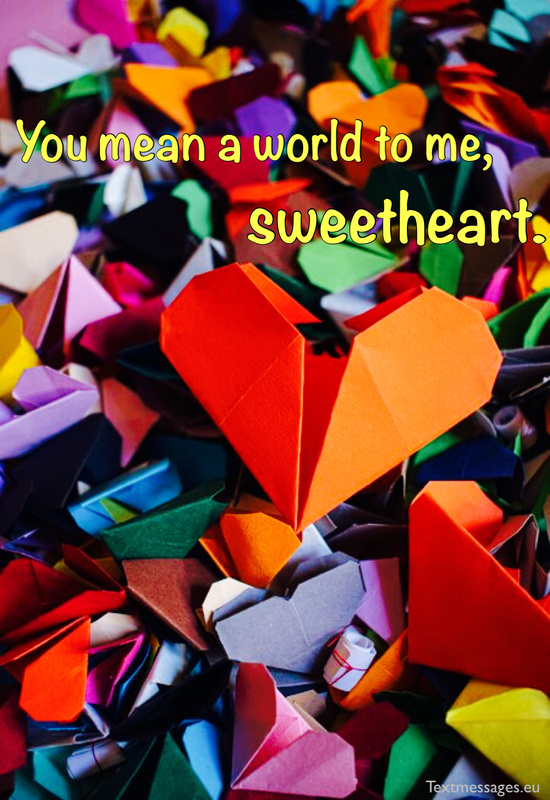 You mean a world to me, sweetheart. If only I could hold your gentle hands in mine. If only I could kiss your soft lips. If only I could give you all my love. If only you could be mine… I wish someday such a magnificent girl as you are will notice such a plain guy as me. For now, I will love you faithfully, patiently and wholeheartedly. True love waits, and so do I.
I believe people ruin their relationship when they start taking everything for granted. There’s nothing worse than losing the initial spark and feeling. That is why I will never regard you as an appendage or a pleasant addition to my life. It will never be this way. For me, you will always be the girl I love more than life and fear to lose. It’s funny that you need to change only one letter in the word “love” to get the word “live”. For me it means just the same. I live only when I love. I feel alive, I feel like I’m capable to perform a feat, to save the princess and kill the dragon. And you are my princess. My lifelong and beloved princess. They say one should do things that bring satisfaction and joy. I’m pretty sure my ultimate goal in this life is to make you happy every single day, because there’s nothing as satisfactory for me as to see your perfect smile and your beautiful eyes sparkling with happiness. Now I know what happiness looks like. It looks like you. It has your angel face, your sweet voice, your gentle hands, your silky hair and your kind heart. I really mean it, honey. You are my happiness. I think about you when I do my everyday routine tasks. I think about you when I drive. I think about you when I talk to other people. I think about you when I work. I think about you even in my sleep. My mind is totally consumed by the thoughts about you. You are everything I need, everything I yearn for, my love. It’s such an amazing feeling to know that I’m standing against the world in the company of the most magnificent, strong and intelligent woman. Together we’re able to move mountains, to make each other better, to love wholeheartedly and exercise our best qualities. Together we’re able to be truly happy. 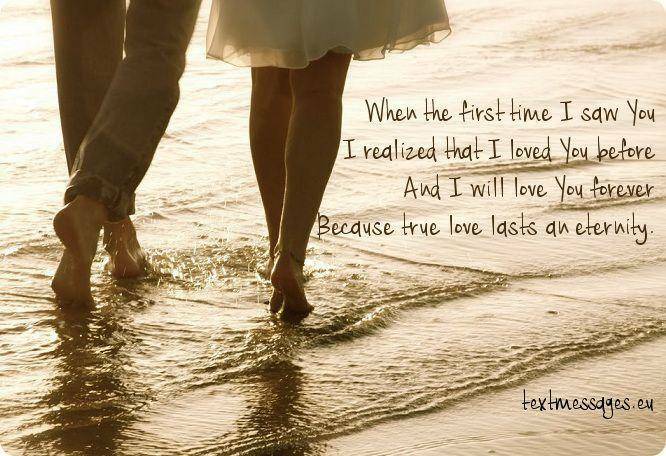 I hadn’t known the taste of true love until I met you. You taught me to love, to express my emotions, to care, to bear the responsibility. And now I feel like I’m complete. I love you honey, and I’m extremely grateful to you for everything you’ve done for me. May this never end. The best way to find your own path in life is to share it with somebody else. I will never regret choosing you as my loyal companion, my love and my hope. You make me want to continue my way no matter how hard it gets sometimes. When I look at you I see all the best things in my life. 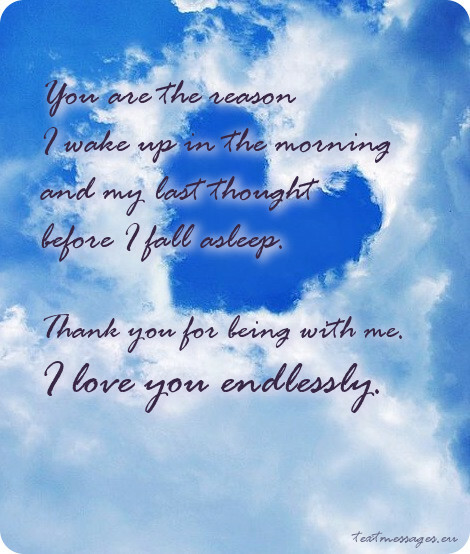 You are the reason I wake up in the morning and my last thought before I fall asleep. Thank you for being with me. I love you endlessly. It’s easy for me to wake up in the morning because I know that I will see you soon. I want to spend every second of my life with you, baby. You are the love of my life. Everybody says that love hurts, but I don’t care, because even to be hurt by you seems like a blessing. You are perfect to me, darling. My love for you is everlasting. I’ll be with you till the end of time. The biggest happiness in my life is your smile. Seeing you happy is like being blessed again and again. I love everything about you, and nothing will ever change that. Thank you for being you. Love you endlessly, baby! It is impossible to fall in love just once. Because every time I look at you I fall in love again and again. You look like a true masterpiece, you sound like a song. I love you so much, baby. Love is the best thing in life. It makes you feel like you can do anything for someone you love. And I do feel this way about you. You are my biggest treasure, baby. Let’s stay together forever. You know, now I’m having one of those moments when I realize how lucky I am to have you in my life. Your love is something that keeps me alive. I want to thank you for everything you do for me. Love you endlessly, baby. Try to imagine how enormous our universe is. You can’t, can you? Cause it’s endless. That’s why I can’t imagine my love for you neither. It has no end. I love you so very much, baby. Thank you for being with me. There is no other person in the world who could make me as happy as you do each and every day. You are my other half for sure. I can’t imagine me without you by my side. Thank you for everything, honey. When I receive texts from you I feel like the happiest man on Earth. 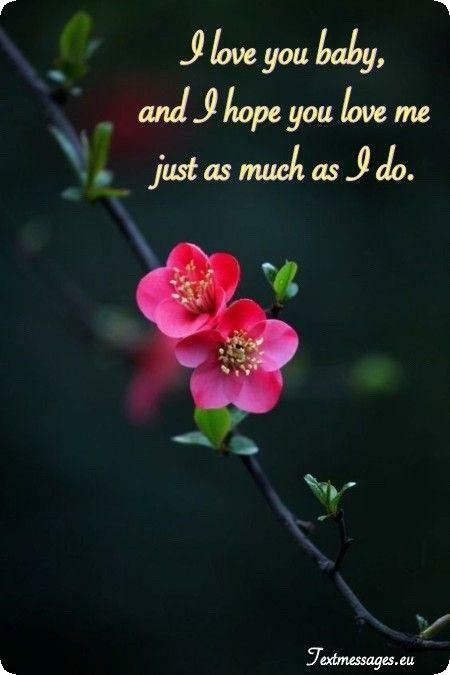 I hope that you feel the same way about me, that’s why I’m writing it now. I love you more than anything in the world, don’t you ever forget that. 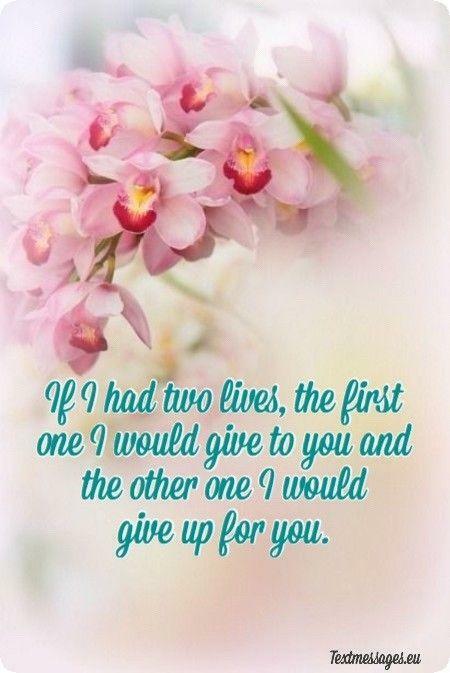 If I had two lives, the first one I would give to you and the other one I would give up for you. You are the one and only woman in this world I want to marry and make the mother of my children. I guess, it’s fate. I have never thought that I will meet somebody like you. I have never thought that such a wonderful woman will fall for somebody like me. But it all makes me think that real love exists and I am the lucky one to have it in my life. You have always told me that I’m surrounded by a giant amount of beautiful girls, like they are supposed to attract me in any way. But the only girl I need is you, baby. It’s impossible for me to even think of someone else, because you are the love of my life. I miss you so very much. So I wrote your name in my heart, and it will stay there forever. 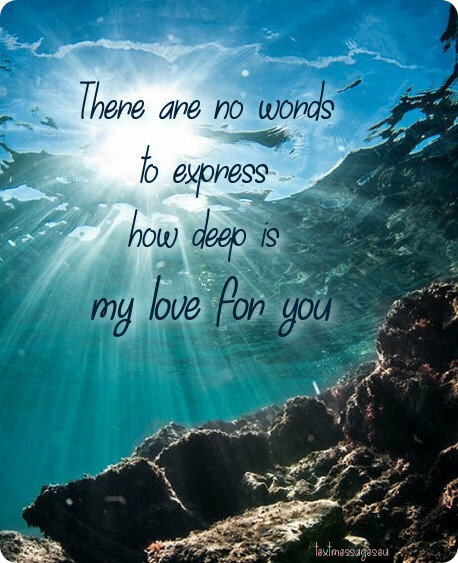 There are no words to express, how deep is my love for you, dear! You are like a completely new planet and I’m an astronaut eager to discover it. I hope you will allow me to do it and probably one day I will settle down there, on your planet. When I see you, I still get butterflies, It’s just like the first day I saw you, Love from first sight, I know that you loved me since we met, and I know you will love me until I die, that’s why I love you even more. I need you like a tree needs the sun and a bird needs its wings, you are essential to me, I love you so much! So that I can shine during your darkest hours, when the sun is not around. 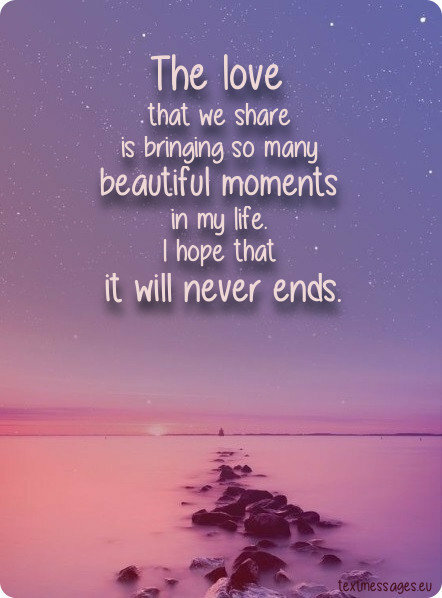 The love that we share is bringing so many beautiful moments in my life. I hope that it will never ends! Love never asks who are you, it just says that you are mine. Love never asks where did you come from, it just says that you live in my heart now. Love never asks „Do you love me“, it just says „I love you“. I love you, now and forever! We’d fall in the snow, we’d love each other madly. So I wanna ask you, would you fly with me? My days would be meaningless, if I would not love you. I wish we always stay together. 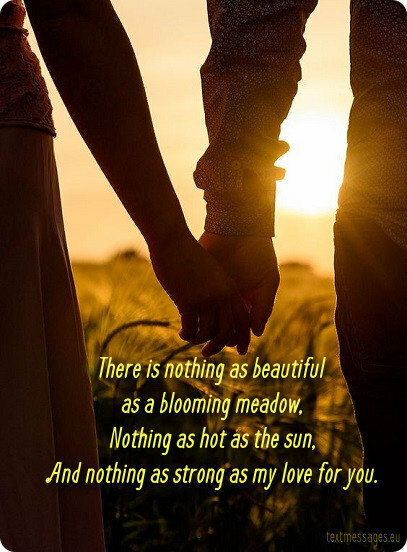 And nothing as strong as my love for you. Your understanding, care and unconditional love have changed my life. My days became meaningful, because you are a promise of my happiness. Love you more than I can say with colourless words! The best gift from you is to see you smiling and feeling happy. Sometimes life can be tough, that is why I’m here – to love you and to take care of you. Let me love you, never let me go. You’re the most precious person in the world to me. Have you ever seen a night sky full of stars? It’s a real magic, which can only be compared with you. 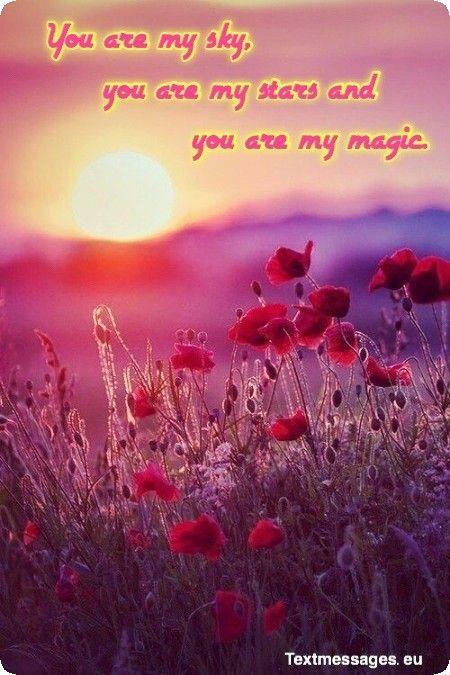 You are my sky, you are my stars and you are my magic. I wish you could know how much you mean to me. Honey, I need to tell you that I will stop loving you when a pear will grow on an apple tree on the 31 of February. The most amazing thing about our relationship is that we will always be in love with each other no matter what. Even the distance between us can’t tear us apart. I love you to the moon and back, darling. Your touch makes me shiver. Your voice gives me chills. You came from a different world, that’s for sure. You are the only person who can make me weak. But I’m okay with that. Love you endlessly, baby. Some people start their day with a cup of coffee, other ones – with a peace of dark chocolate. 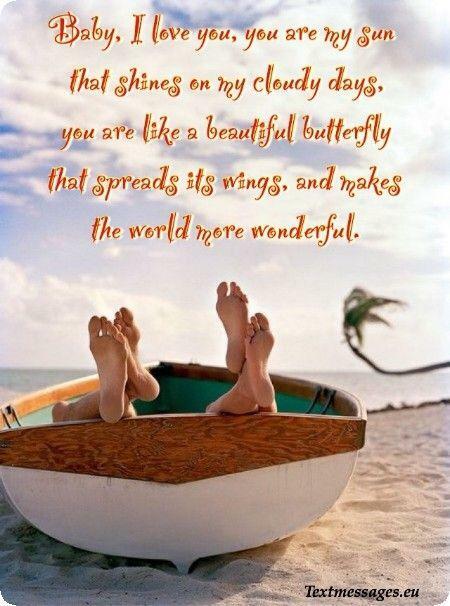 But my each and every day starts with a thought of you. 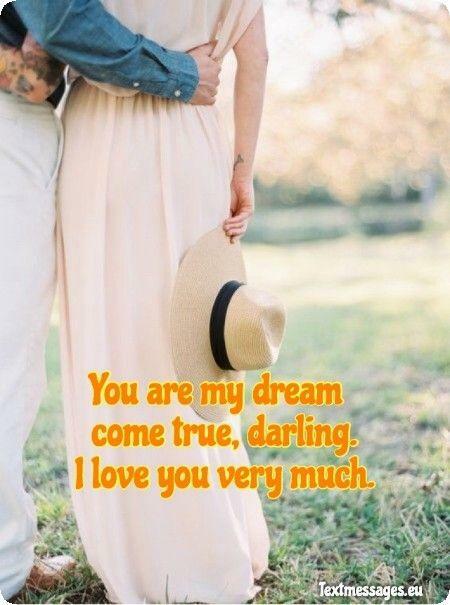 You are my dream come true, darling. I love you very much. When someone asks me if I have something worth fighting for in my life, I immediately remember your face. I would win a war by myself for you. You are the reason I breath. Love you endlessly, girl. If I don’t see you every day, I feel like something is missing. Like my heart. You are the one and only owner of it, baby, and I would never give it to someone else. Love you unconditionally, thank you for everything. 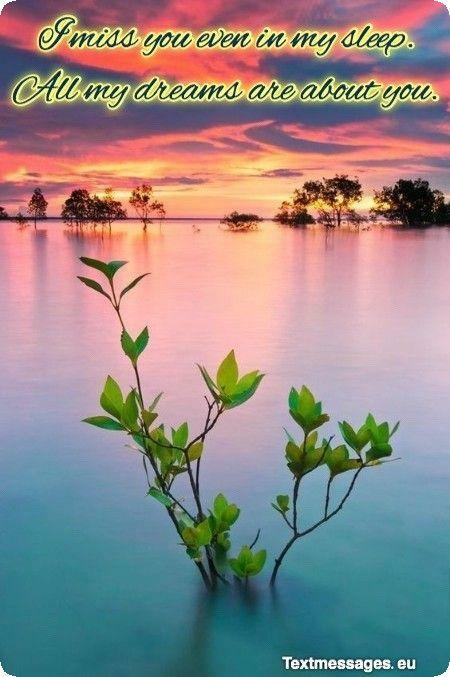 When I think about my past, I cannot even remember my life without you in it. You are the sense of my life, baby. There is no way I can live without you. Thank you for choosing me, love you forever. I know that my heart is safe as long as you have it. I’m so lucky to have you in my life, baby, it’s insane how someone like me could have a girl like you. You are the best thing that has ever happened to me. Love you endlessly. You are the one, I cannot live without. Just texting you to make sure that the love of my life is having a great day. Always remember, that I love you more than anyone in the world, and I’m always here to support you no matter what. Love you, baby! It is insane how your voice gives me chills every time I hear you. I’m obsessed with you, baby. I want to see you every second of my life. Don’t you ever leave me. I will love you till the end of time. I thought that my heart is secured, but then you came along. You occupied my life with your presence in it, and now I can’t imagine my day without your beautiful laughter. I love you endlessly, girl. I want you to be my Valentine each and every February 14th. We will be together forever, because I cannot imagine my life without you in it. Thank you for being you, baby. Baby, each time I look at your eyes, it’s like the first time, I get butterflies, feels like I’m on cloud 9 and this is true love. 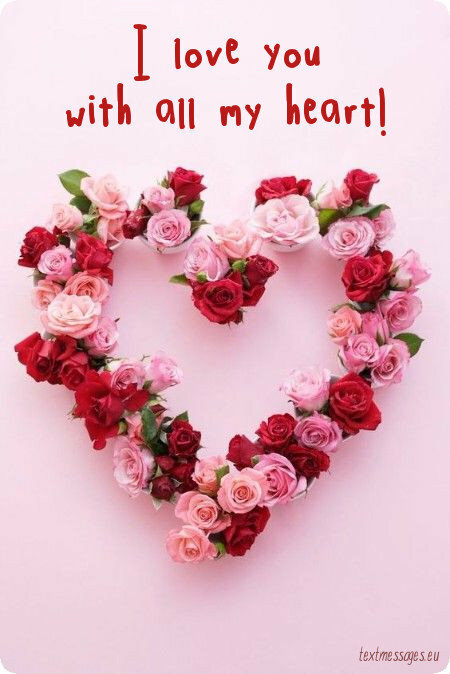 I love you with all my heart! Every night I go to sleep thinking about how blessed I am to have you in my life. You are my Sun, Moon and the Stars, and I will do anything for you, love. Thank you for being with me. Even on Mondays I don’t feel as miserable as everyone else because I have you in my life, baby. You make my every day special, and I want to thank you for that. I’ll love you till the end of time. You deserve the best of all this world can give. That’s why you have me, baby. Just kidding. I love you like I’ve never loved anyone else, and this is special. Let’s stay together forever. It’s not being in love that makes me feel butterflies in my stomach. It’s being in love with you, baby. You are the secret ingredient to my happy life. Thank you for being so amazing. Love you endlessly. The next girl that I will love as much as you will be our daughter. Waking up with you is the sweetest thing in my life. The Sun kisses your soft lips as you open them to say something to me. All I see is you, baby. I love you like crazy. Thank you for being with me. You know, I’d rather spend a moment holding you in my arm than a lifetime being with someone else. You are the reason I wake up each and every morning. Love you like crazy, never let you go. You fulfill my every thought. It’s insane how I can’t pour myself a cup of coffee without thinking of you. I guess it happens when you love someone as much as I love you. Thank you for you, baby. My life without you is like the sky without stars. It loses its endless beauty and charm. I need you to be with me till the end of time. You are the love of my life, baby girl. 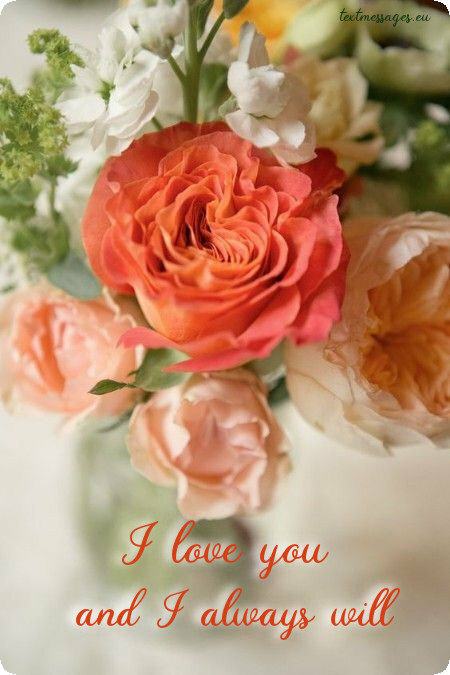 I love you, I know I say it a lot, but I really do… I know words mean nothing these days, but actions do a lot, that’s why I’m showing you how much I love you. I have never thought that dreams can come true. But when I met you a realized that we live in a world full of miracles. You are my biggest miracle. My most amazing magic. Thank you for always being with me. I know that it sounds clichè, but you are my oxygen, darling. There is no way I could live without you. You fulfill my every thought, and that’s why I will never get over you. Loved you then, love you know, will love you forever. You know that I don’t have much to give you. But you have to know that I will always give you all that I have. You have my heart, baby, so please keep it forever. Love you so very much. I know that it is hard for you to trust people. But you can be sure in me. I will never let you down, baby. You are the most precious thing in my life. Thank you for everything. Sometimes I wonder how a girl like you could fell in love with someone like me. I can’t stop thinking about your beautiful shiny eyes, charming tender smile and soft warm hands. 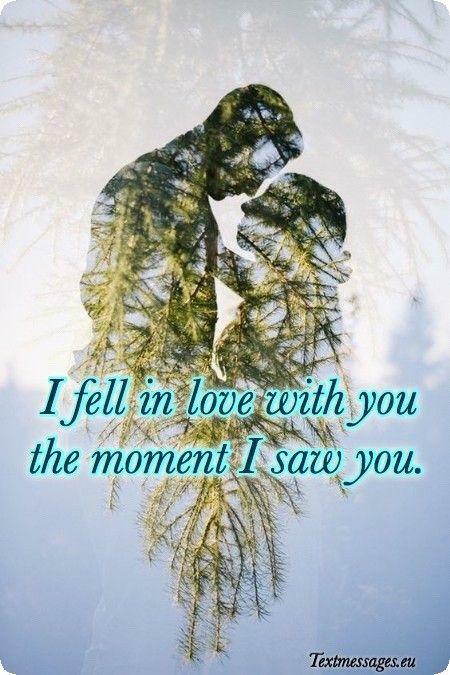 I think I fell in love with you the moment I saw you. You’re the one. I’m missing you like crazy. Without you I feel like I’m not myself. I don’t know what to say or what to do when you’re not around. You make me feel so special and unique, I can’t believe that I am lucky enough to have you in my life. Love you endlessly. I want to shout about my love for you from the rooftops. You are the best thing that has ever happened to me. You’ve changed my life in so many beautiful ways. I will love you forever, baby. Thank you for being you. What is life without you in it? I don’t want to know, baby. You are a part of me, and not having you is like not having heart. Thank you for being with me no matter what. I love you endlessly. I want to be your defender. Your knight in shining armor. Your shoulder to cry on. Your biggest support. My love for you is enormous and everlasting. 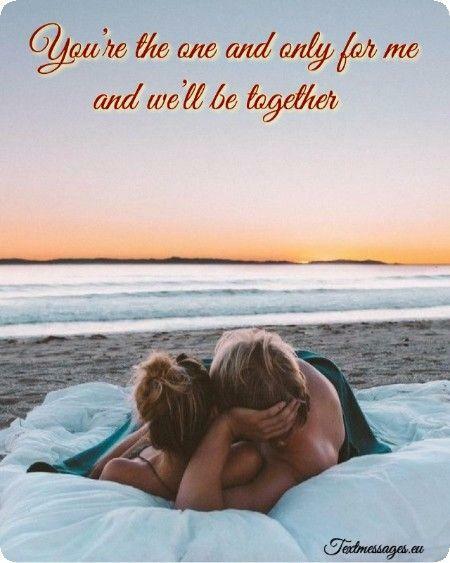 Let’s stay together forever. I love so many things about you… You are sincere, helpful, loving, you have a beautiful body, face and stunning smile, but your heart is even prettier, it doesn’t matter if you have no make-up on, or you’re wearing sweat pants, I still love you and I always will. Words cannot express the way I feel about you, baby girl. You light up my world like no one else does. Your smile is my Sun. I will do everything to make our relationship last forever. You are so beautiful. Even when you cry, your face is a masterpiece. I want to look at you till the end of time. I feel like you are my other half, baby. My love for you is everlasting. I see you in every single person I meet. You fulfill my every thought, and I just can’t stop thinking about you. Baby, don’t you ever leave me. I’m head over heels in love with everything about you. 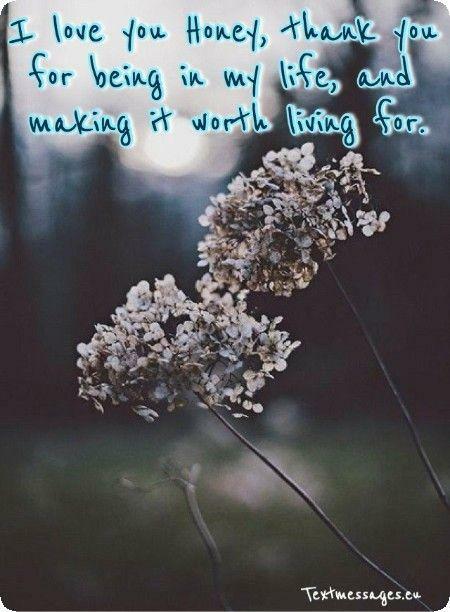 All of the days I spend with you are worth living for. You became the sense of my life, and now you have no chance to run away from me. I love you like crazy, baby girl. I remember the first day I saw you, you were like an angel, you were like an answer to a prayer, and you still are, because I fall in love with you every day even more, thank you for being with me, I love you baby. 24 hours a day spent with you is not enough for me. I want to hold your hands all the time, and it hurts me when you are far away. Please, don’t you ever leave me, baby. I love you endlessly. No matter where you go or what you do, I will always be by your side. You can count on me, baby. 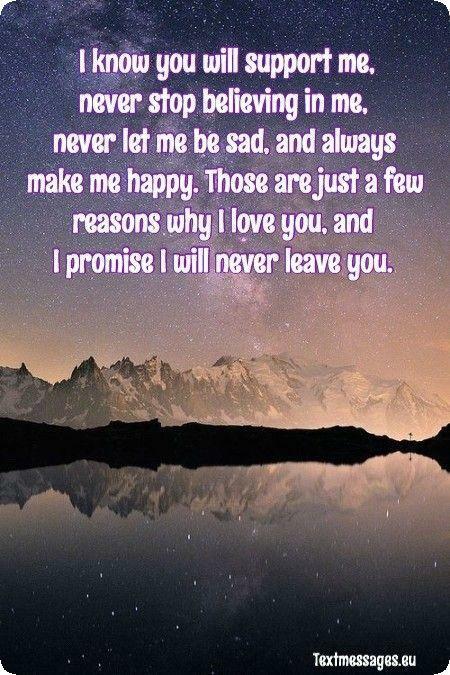 I will never leave you. Thank you for being the most amazing thing that has ever happened to me. Your love is something that makes me feel like I can fly. Let’s run away together and spend a lifetime looking into each others’ eyes. I am the happiest man on Earth to have you, darling. Thank you for being you. No other girl could make me as happy as you do every single day. You inspire me to do things I’m afraid to do, you make me feel like I am special. I will do anything to make you feel this way too. Love you endlessly, baby. The sun is shining, birds are singing, flowers are finally blooming. But I don’t feel happiness as everyone else does, because I miss you so much. Just a thought of you makes me go crazy, love. 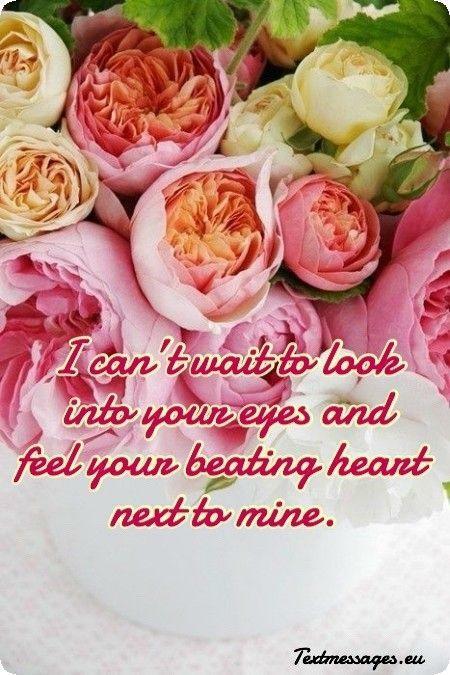 I can’t wait to look into your eyes and feel your beating heart next to mine. It was hard for me to understand how love works. I’ve been trying to find the answer for years, and then you came along. Suddenly I understood that love is something that you can’t explain. I love you unconditionally, baby. I’ve been waiting for you for all my life. When I saw you I immediately realized that you are my destiny. Girl, let’s stay together forever, because I can’t live a day without your beautiful smile. I have always been lonely. I liked it and didn’t want to change my life. But then I met you. You’ve showed me the world full of beauty and love. 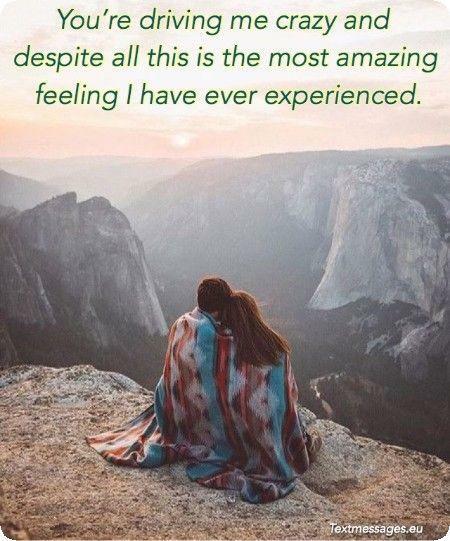 I’m so grateful for that. Love you endlessly, baby. Roses are red, violets are blue, I’m not a poet, but I’m so in love with you. You make me wanna write the most beautiful poems, cause my heart is fulfilled with feelings for you. You are the love of my life, baby. 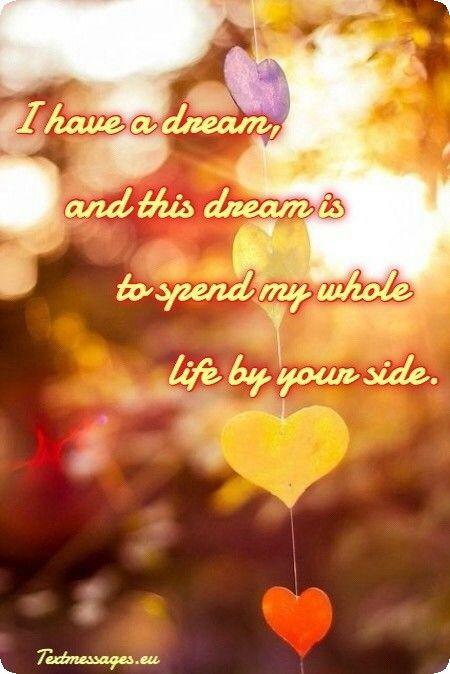 I have a dream, and this dream is to spend my whole life by your side. 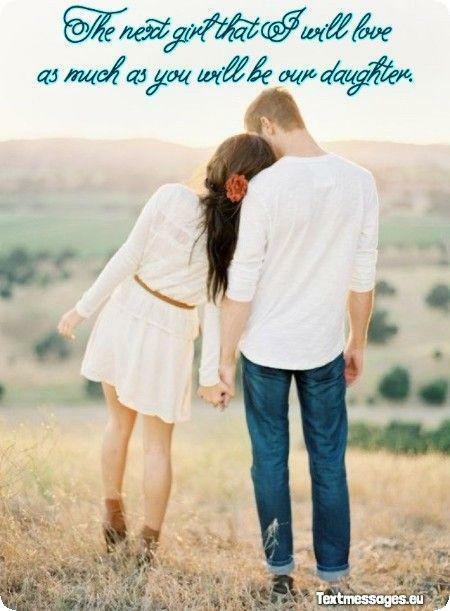 You can call me naive and too romantic, but I believe in true love as well as in our bright future together. When I am with you I feel at home. You are the reason I smile and laugh, cause you make me happy each and every day. There is no way I could ever love someone else like I love you. You are everything to me. You mean the World to me, baby. No other person can make me feel the way you can. Being with you is like living in a love song. Thank you for being my best friend and greatest lover. Love you endlessly. There is not and there never was such a man in the world who was able to love as strong as I do. Sometimes you make me go crazy, sometimes I can’t sleep because I’m dreaming about you all nights long. Sometimes I can’t express my feelings in a proper way, but you should know there’s no such a thing I wouldn’t do for you. Trust me, my love. People have been searching for the meaning of life for centuries, but I was able to find it in a second. The second I met you. One look at you was enough to start falling in love with you irreversibly. I suppose there’s no way to stop loving you. It’s my lifelong bless, and I don’t mind at all. Missing you is a torture. I got so used to you being by my side all the time that my life feels so empty when you are not around. All I see is your beautiful shiny eyes, illuminating with love and tenderness. Missing you so much, dear. I love you. Wandering around the city, buying food at the grocery store, drinking coffee in the morning… All these things seem really simple and ordinary, but sharing them with you makes them extremely special. It’s amazing how love changes and transforms even the most trivial things for the better. What are you doing to me, sweetheart? I can’t eat, I can’t sleep, I can’t think the way I used to think. I can’t control myself if as I was at the mercy of some outer force. You put a spell on me, didn’t you? The most pleasant spell the world has ever seen — the spell of love. It’s unbearable to love somebody who doesn’t love you back. It’s insufferable to dream about someone who doesn’t dream about you. It’s so painful to know that your heart belongs to someone whose heart can’t accept this love. Despite all my suffering and anguish, I will never stop loving you. Since the moment I met you, I knew that I wanted to share my whole life with you. Share my days and nights, my food, my trips, my joys and sorrows, my favorite books and music. 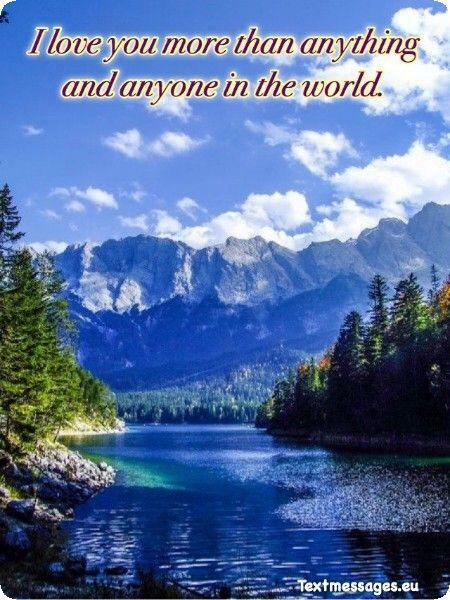 Everything in this world. And I hope that someday we will share our home and children together. I really do. I have always thought that love is a feeling, but only now I see that it’s a deliberate choice. And I know for sure that I’ll choose you no matter what. You’re the one and only for me and we’ll be together despite all odds. I have no hope for our future together. Instead, I have a strong faith, because I’m pretty confident that we will have it all. And by “all” I mean happiness and true love in each other’s arms for many long years. I love you, honey. There’s nothing more thrilling for me than to watch you act like a happy and naive child. And I promise I will do everything it takes to keep you smiling and enjoying every minute of your life. It’s my life mission, and I won’t fail. I won’t give up without a struggle. I know that you don’t love me as much as I love you, but I believe my feeling for you is so enormous and hot that it would be enough for the both of us. Please, take a closer look at me and you will see that I’m worthy. You will see that I love you wholeheartedly. I know that we are on the edge of collapse and it’s getting tougher to keep the balance. I know that you’re extremely tired of it all, I know that you want to give up. But I beg you for the sake of our love to give it one more try, one more chance. I promise, I will do everything I can to fix it, because my love for you won’t let me give up on it. One day I promised you, I will never leave you, and since that day I’ve kept that promise, because I know you hate, when people brake them, I love you baby, and I hope you love me just as much as I do. Sometimes I wonder what you see in me. I’m just an ordinary guy, and you are the most incredible girl I’ve ever met. You’re better than sunshine because you are able to warm me from the inside. You’re my portable happiness, and I will never forgive myself if I lose you. Love you, my sweetheart. My love for you is so huge that sometimes I can feel it overflow my body and my mind. Sometimes I’m ready to burst, because this burning feeling inside me doesn’t ever calm down. Sometimes all I can think about is you. I’m so attached to you that I can’t even imagine my life without you. Sometimes I’m just lying awake at night and listening. I hear your breath and heartbeat. You look so fragile in your sleep that I can’t stop admiring you. I’m going to guard your precious sleep, honey, because I love you. There’s nothing more magnificent than being together with you. It’s the greatest pleasure on the planet, the most generous bless a man can get. I don’t know what I have done to deserve it, but I can tell you for sure that I will do my best to preserve it. I love you, sweetheart. Heaven is when your warm tiny hands are holding mine. When you get angry because of me laughing at you. When you tell me about how your day went. Heaven is a place where I can be with you for the end of time. I love you more than anything and anyone in the world. I have never thought that caring about someone else than me can be so amazing. Before I met you, I had been a self-centered person who cared only about himself and his own needs. Now I feel like I’m mature and complete. I’ve learnt to love; to share everything I have with the love of my life. I would do anything to prove my love and devotion to you. You’re the only person in the world I’m ready to devote my life to. I’m yours completely, undoubtedly, invariably. Nobody will ever change it, trust me. Sometimes I lie awake at night and picture your face. Your flawless skin, delicate cheekbones, soft lips, shiny eyes. You are a perfection, my darling, and there’s nothing more pleasant to me than thinking about you. I hope you think about me, too. If many years pass by and for some reason, we will no longer be together, I can still promise you one thing: I will never forget you. I hold a special place for you in my heart, and it will never change. Sometimes it’s impossible to get rid of memories, and you’re exactly this case, sweetheart. I see your eyes, they sparkle when you look at me, just like mine do when I look at you, I know you love me, and I love you even more, thank you for supporting me, and being there for me honey! If the world ended tomorrow, what would you do? I would spend my last hours embracing you, kissing you and telling you how much I love you. There’s nothing more important to me, and I really hope you know that. Please don’t be so cold-hearted and indifferent. I love you more than life, and I don’t know what else I should do to win your attention. Just give me a chance, and you will see that we are a perfect match. There’s nothing I can’t do for you. I will make you happy and wealthy. I will give you anything you want. But in return, I want to get your love and care, because there’s nothing more inspiring for me than this, my love. What’s the point of living if I can’t have you? You are my sunshine in the darkest hours, you’re my summer when I need to get warm. You’re my hope when I get lost. You make me feel alive. 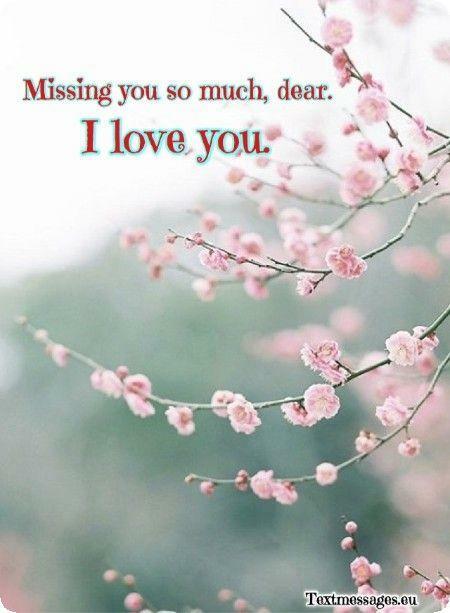 I miss you, honey, and looking forward to seeing you soon. Just the way you look at me makes me shiver. You are such a beautiful human being, and I’m not talking about something particular. Everything about you is perfect. I can’t wait to see you, to hold you in my arms, to feel your body close to mine. I love you very much. If you could feel what I feel, then you would realize that I’m madly in love with you. All my friends say that I’m going crazy, because all I can talk and think about is you. I guess the only chance for me to get some relief is to see you again. Darling, we all have our secrets and the past we don’t want to talk about. And it’s okay, because the only thing that matters is who you are now and that we love each other. Leave your past behind, because I want us to enter the bright and happy future together. Sometimes I feel down and disenchanted, but every time I remind myself that I have you. Just thinking about you makes it all go away. You are my medicine that cures everything, and if you stay with me, I will be the healthiest and happiest man. Please, don’t tell me it’s over. We’ve been together for so long, and I won’t stand being alone without you. 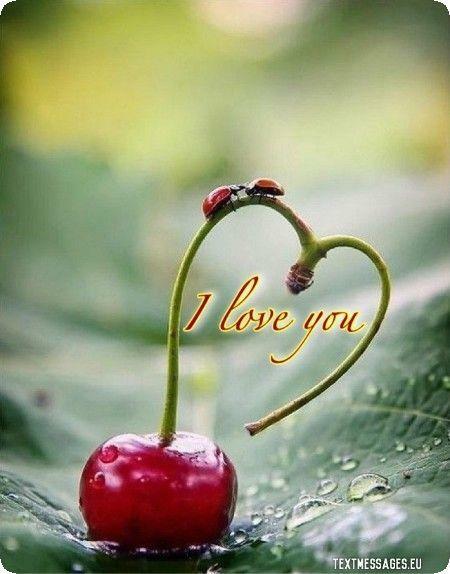 I love you, I care about you and I will get lost without you definitely. Darling, we can work everything out — all we need is just a little bit of patience. I miss you even in my sleep. All my dreams are about you. And when I wake up in the morning the only thing I want to see is your angel face right in front of me. And you face is the thing I want to see when I fall asleep as well. If for you happiness means to separate and go our own ways, then I will accept your choice. Perhaps. Someday. Probably, never. Don’t expect me to give up on you so easily. You are the love of my life and I will fight until the end to win back my right to be with you again. This is all I want. Honey, if I had to choose the woman I want to spend my entire life with and have our children, it would definitely be you. You’re the most amazing person I’ve ever met, and it will be a great honor for me to become your beloved husband one day. I hope we dream about the same things. Our love is made of many things. It’s made of our long and quivering midnight talks, of fiery kisses and tender embrace, of care, respect and support. It’s made of you and me — the best match in the whole wide world. 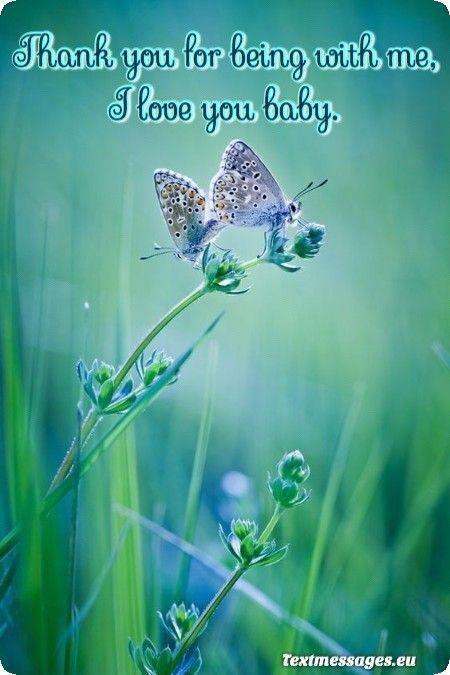 I love you, sweetheart, and I will never get tired of telling you this. Relax and close your eyes. Breath in slowly. Do you feel your heart beating? At least, you got your heart, because I don’t have mine. You took it away from me and made it yours. Now you have both of our hearts and I wish you would treat them gently and with love. I trust you, honey. I’m a fool in love. You’re everything I can think about and I’m not sure if it’s going to end. I can’t sleep, I can’t eat, I can’t work. You’re driving me crazy and despite all this is the most amazing feeling I have ever experienced. I know you will support me, never stop believing in me, never let me be sad, and always make me happy. Those are just a few reasons why I love you, and I promise I will never leave you. I’m so blessed, that I get to wake up every morning to that beautiful smile, to those amazing eyes, and that stunning body, I love you Honey, thank you for being in my life, and making it worth living for. 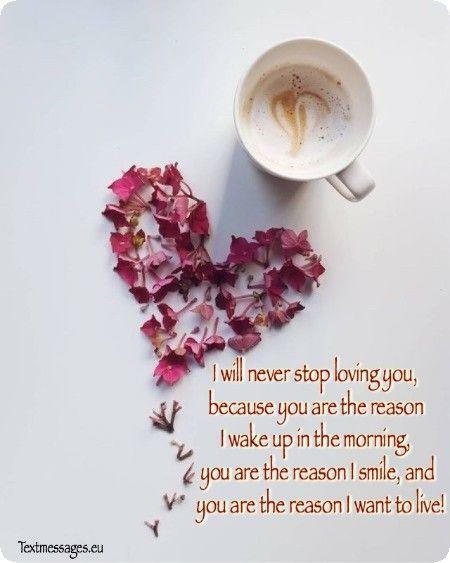 I will love you until the sun dies, until the birds stop singing, I will never stop loving you, because you are the reason I wake up in the morning, you are the reason I smile, and you are the reason I want to live! 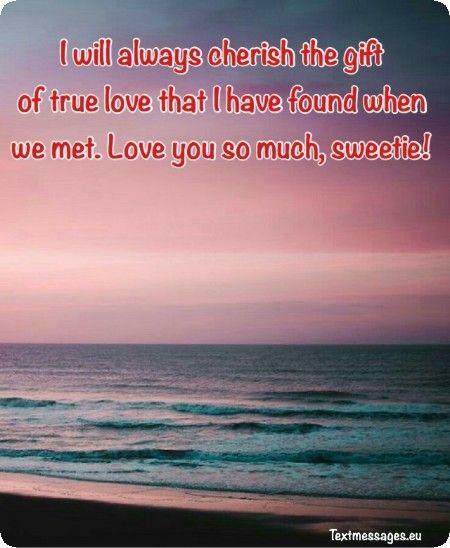 I will always cherish the gift of true love that I have found when we met. Love you so much, sweetie! 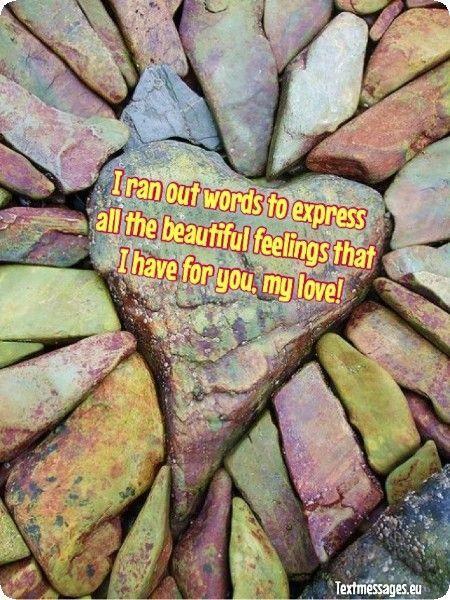 I ran out words to express all the beautiful feelings that I have for you, my love! My world has totally changed from the very first day when we have met. You help me to notice all the beauty of daily life and I thank you for everything that you gave me! When the first time I saw you I realized that I loved you before and I will love you forever, because true love lasts an eternity. 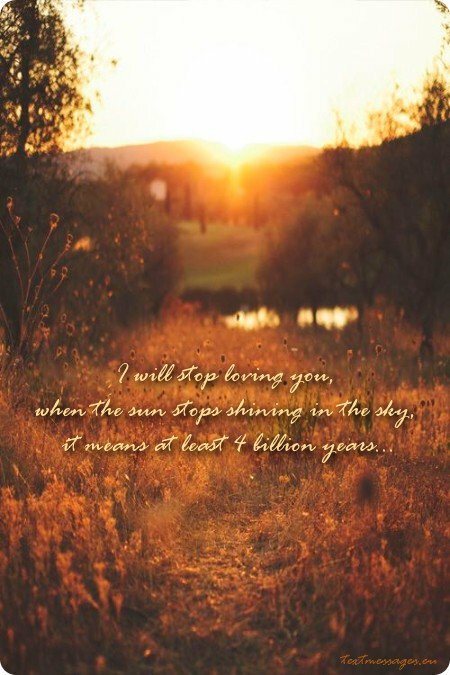 I will stop loving you, when the sun stops shining in the sky, it means at least 4 billion years!